Two “4+1” pathways are in effect at Buffalo State, with more in the planning stages. “These four-plus-one pathways are designed to enable undergraduate students to take graduate courses and get a jumpstart on their master’s degree,” said Kevin Miller, interim dean of the Graduate School. 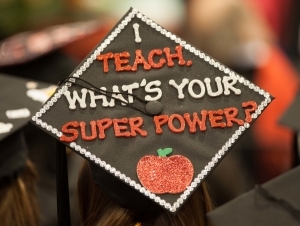 In the School of Education, a pathway exists that enables undergraduate students in the early childhood education program to take graduate courses in exceptional education. Students accepted into the early childhood/ex ed pathway receive a roadmap specifying the course schedule required for students to successfully complete the program. “Students can graduate with a master’s in five years, qualified to teach young children in early childhood, special education, and inclusive classrooms,” said Wendy Paterson, dean of the School of Education. The second 4+1 pathway offers students in the dietetics and nutrition program the opportunity to begin coursework toward a master’s degree in adult education while enrolled in either of Buffalo State’s dietetics program. “It’s exciting because students can complete the master’s in adult education entirely online,” said Carol DeNysschen, associate professor and chair of the Health, Nutrition, and Dietetics Department.